AutoCAD Mechanical 2012 is the latest drafting software that was developed by autodesk, drafting software which has long been a leader for Mechanical design architect, presented newest version, which allows an architect can more easily visualize the design of Mechanical in digital prototyping, using AutoCAD Mechanical 2012 software, you can save the your work time, make work more efficient and look professional, AutoCAD Mechanical 2012 allows users to choose various tools that will help create a prototype design. equipped with tools for almost every aspect of the mechanical engineering and design process, Standards-based drafting and parts libraries - Supports international mechanical CAD drafting standards and includes libraries of more than 700,000 standard parts, and much more other features. 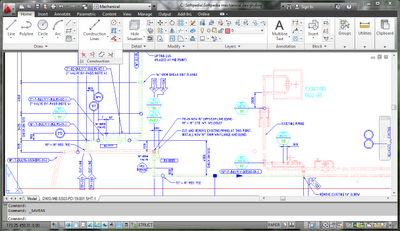 to be able to use AutoCAD Mechanical 2012 software you will be charged a license fee at USD 4495.00, the software is quite expensive, but will be comparable with the various features and their work, on the screenshot above, AutoCAD Mechanical 2012 interface is quite complicated for someone who is not going out for an architect designer, but I'm sure if you are an architect designer would be very easy to understand the various functions in the AutoCAD Mechanical 2012 software, for you who want to try AutoCAD Mechanical 2012 software for USD 4495.00 for free, you can download it by visiting autocad website.